Additional Info: NEW FOR THIS YEAR! Platinum rated holiday home right on the water front. Decking with gorgeous rattan furniture. 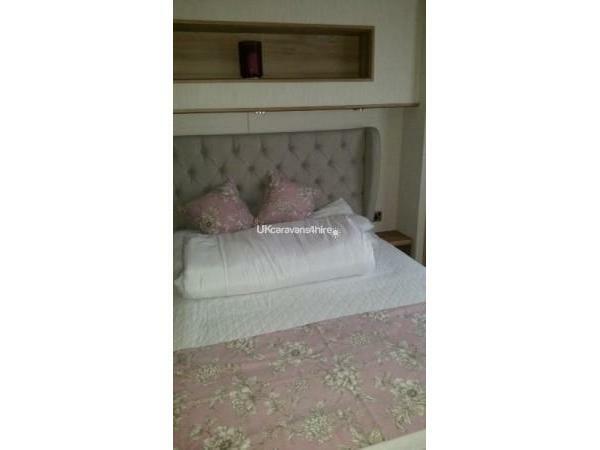 Master bedroom has king-size bed with shower en-suite, TV and walk in wardrobe. Kitchen has all modern appliances including full size integrated dishwasher. In the lounge there is Flat screen TV, DVD player and Blue tooth music speaker. Fully stocked with a selection of DVD's. £50 deposit on booking. Balance payable 4 weeks prior to holiday. Plus £50 refundable deposit against breakages. Short breaks available in off peak. Contact for details & prices. 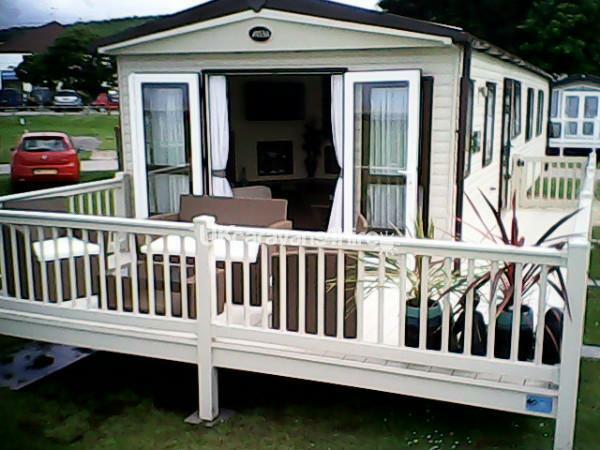 Fully equipped holiday home on an award winning Haven site at Doniford Bay, Watchet. 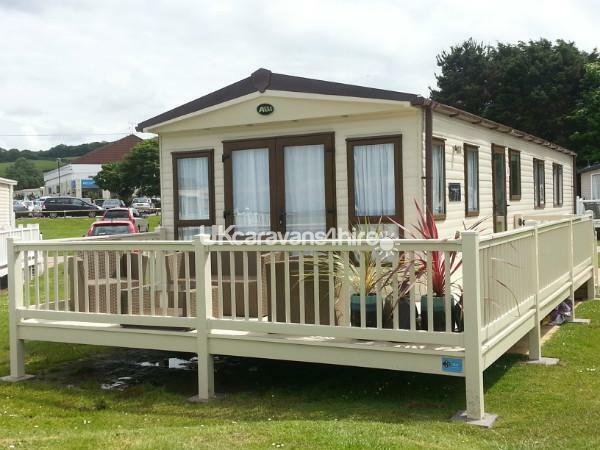 The caravan is sited on the Waterside area of the site and enjoys wonderful uninterrupted views of Bristol Bay. 2 Bedrooms. Master has a king size bed, en-suite, flat screen tv and walk in wardrobe. The 2nd bedroom has twin beds. Fully equipped kitchen including a dish washer with dining table and chairs. The lounge has a 39" flat screen TV, DVD player and Bluetooth music player. Wall mounted fire and comfortable suite to relax in after a fun filled day visiting all the surrounding local attractions including Dunster Castle, The picturesque Quantocks or a ride on the West Somerset steam railway. Short breaks are also available out of school holidays. Please contact us for details. Additional Info: Lots of children's play areas and of course. The beach! I stayed with my husband and 2 children aged 5 and 9 for 4 nights, booked directly with Penny. It's a beautiful caravan, the photo's really don't do it justice. The master bedroom has it's own en-suite with a spacious shower and even a walk in wardrobe which was very useful to store our bags. Nice vanity table and even a hair dryer available for use. There is plenty of space, it was clean and very comfy. The living area had plenty of space for us all to relax. The location on the park is good, close to the facilities but in a peaceful position overlooking the sea - a fantastic view! Bedlinen wasn't included that would be one thing that could be better but it's not much hassle to take your own.We had a lovely stay and hope to book again. Thank you Penny. Just returned from a 7 night holiday with my wife and children aged 15, 14 and 4. The caravan was everything we could have hoped for. A great location with uninterrupted view of the sea but also only a 100 metres from the main complex so no long walks back after swimming or a night out. The park is not one of the most lively Haven sites but this is what we wanted and we have stayed on this site before. The caravan is clean, tidy, well equipped and is by far the best all round caravan we have stayed in, The decking area is ideal for hotter days and even when it is not that warm as was the case when we stayed we could leave the French doors open and just admire the view including the sunsets. Penny made everything from booking to monthly payments very easy and plain to understand and everything I needed to know was supplied. The accommodation is rated the same as the top for Haven and when compared to their prices is very good value for money. 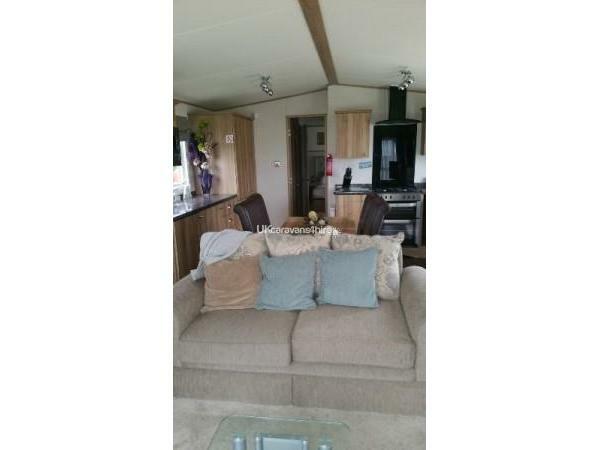 If you book this caravan you will not be disappointed and in fact as was my case it will surpass your expectations. Just spent a long weekend here, Penny was very helpful and very friendly with the whole booking process and kept us informed at all times. The caravan itself was absolutely beautiful. Very modern and tasteful, very clean and tidy and so comfortable, we didn't want to leave. Small touches like candles, ornaments, plenty of plates, glasses and cups, even a hairdryer and iron, made it so much easier, there wasn't anything that we didn't have! 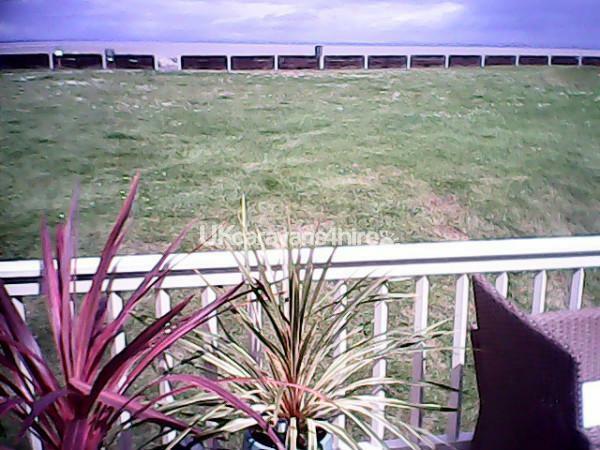 The location on site was fab, right in front of the sea with just a small patch of grass in between. Close to the Club House but at the same time quiet and not disturbed at night with the noise that usually comes with a Club House. We will definitely be staying again! Have just returned from a lovely few days away .The caravan was amazing well above expectations. the location was pprobably the best location on the site , it had amazing views, was close to everything but was also very peaceful . Cannot fault anything , will definitely be returning . Hi David & Penny, We've just returned home from a 4 night stay at your lovely caravan in Doniford Bay (allocated by Haven). My family had a great time there and we all loved your caravan! What a pleasure it was to stay there! We found it fantastic! It really was like a home from home. Best Regards, Carl, Dawn and Annabel.